Someone has rightly said, ‘When there is a will, there is a way’. This is what Jeff Hanson teaches us. 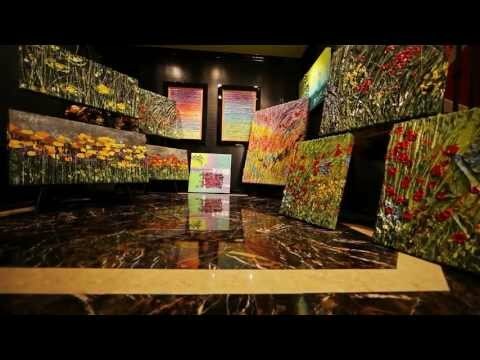 This 21 year old young is blind, but is an accomplished artist with about 1,400 paintings under his belt. But what fascinates most is Jeff Hanson’s contribution to the world; he has raised more than $1 million for charity, through his masterpieces. Jeff Hanson was diagnosed with neurofibromatosis, a genetic disorder which caused a brain tumor that eventually left him blind. His mother, Julie, first introduced art to him, as a distraction from the chemotherapy treatments he had when he was young, which eventually became Jeff Hanson’s hobby. Later, his hobby turned into a successful profession, with the selling of his paintings for around $4,000 each. The fan list of Jeff Hanson’s paintings includes the famous personalities like Warren Buffett and Elton John. I thought it would be good to give back to the world and not use it for myself. My art makes people happy. Said Jeff Hanson. Soon, Jeff Hanson’s art gained popularity and he decided to use his paintings for good. When he was 19, he promised to himself to give away $1 million by the time he turned 20. Jeff Hanson has donated his paintings to over 100 organizations, including the Make-a-Wish Foundation and the Children’s Tumor Foundation. 21-year-old Jeff Hanson relies on texture to create his paintings. He can vaguely make out shapes and colours. Creativity is not everyone’s cup of tea, but the way Jeff Hanson has tackled his blindness and uses art as his strength, is really commendable. But more than that, his contribution to the society as a philanthropist, in spite of being visually impaired, is an inspiration for all.